Religions have been and remain among the most powerful forces shaping human history. Their discourses and practices inform the way we perceive ourselves, those around us, and existence at large, even when we are not actively religious. They are central to understanding both what divides us and unites us. The academic study of religion is a trans-disciplinary endeavor to understand from an objective perspective how religious traditions shape the lives of their adherents, without seeking to promote or disprove any specific belief system. 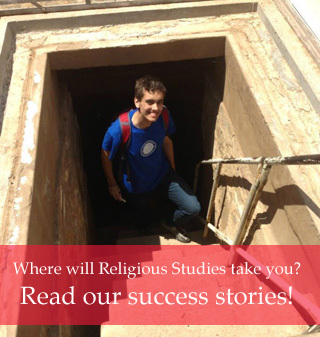 Religious Studies acquaints students with the diversity of religious cultures and introduces them to key methods and theories employed in their examination as "religion." The skills that Religious Studies students gain in critical thinking and cultural awareness lead them to successes in a wide array of career fields, including education, law, journalism, healthcare, chaplaincy, and social justice advocacy. "Religious Literacy in an Age of Religious Nationalism"